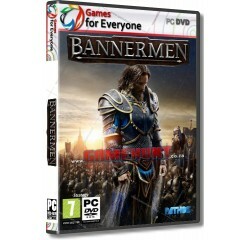 Bannermen - R140,00 : Game Hunt, Where we lead, others follow. With two resources, Wood and Gold, the game takes inspiration from predecessors within the genre and has a very high skill ceiling while still being easier to get into than comparable esport RTS games. While staying true to its roots, Bannermen takes the best elements from the genre and adds its own unique flair to it. The nature of the game is competitive. Matches generally last between 10-25 minutes, depending on playstyle. This fast format allows for intuitive learning and gets you right in the action while making it easier to learn the counter plays than in other RTS games. Singleplayer Campaign - Take on the role of a fallen lord on his journey back to become one of the mightiest in the realm. AI Skirmish - Battle it out with an AI and fight for humanity. Ranked Matches - Climb the online ladder either alone or as a duo to prove who is the best commander. Unranked Matches - Try out new strategies or take it easy while still finding online matches easily. Custom Games - Choose your own team composition and map with up to 8 players. Processor - Intel Core i3-4340 or AMD FX-6300® or equivalent AMD® processor. Memory - 6 GB RAM (Windows 7 - 64bit).